NPR Slingshot artists Mt. Joy this week on ‘World Cafe,’ plus the latest from Elvis Costello. Listen Monday-Friday at 11pm on KXT. 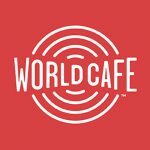 NPR’s World Cafe presents interviews and performances with today’s essential and emerging artists. This week’s artists include Candi Staton, Old Crow Medicine Show, Alejandro Escovedo and Neko Case.